Carey Deacon with her daughter Catherine, who says her experiences have made her want to work in health care and, ideally, at Mayo Clinic. For Carey Deacon, the support of co-workers along with her daughter's medical care reaffirmed her decision to return to work at the "only place she felt passionate about." Carey Deacon sped from her mother's graveside to the emergency room with her 15-year-old daughter, Catherine, doubled over in pain beside her in the car. 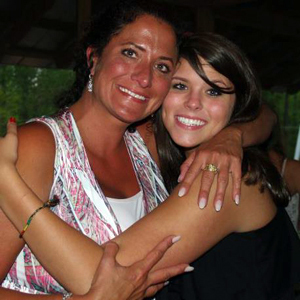 "I was in so much pain that my grandmother's funeral is a blur," Catherine says. At the emergency room, in Newnan, Ga., Catherine had an ultrasound and CT scan to determine the source of her pain. Doctors told Deacon that Catherine's pain was caused by a cyst in her ovary. They sent her home with painkillers, telling Deacon her daughter would be fine and wouldn't require further treatment. Mother and daughter weren't so sure. "The medication didn't touch Catherine's pain," says Deacon. "I called our pediatrician the next day, and after reviewing Catherine's tests, he told me to take her to the pediatric hospital in Atlanta." There, they received devastating news. "Catherine had a tumor on her right ovary that was so large the doctor couldn't see her left ovary," says Deacon. Though the tumor was benign, doctors said, it would have to be removed. Then they explained that because of the tumor's size, it was possible that both of Catherine's ovaries would need to be removed. Deacon realized that would leave Catherine unable to have biological children. "At 15, Catherine really didn't understand what that meant," she says. "But I did." Catherine's surgeon was able to remove the tumor while leaving her left ovary intact. Mother and daughter celebrated the good news. But they soon faced a setback of a different kind. And some decisions. Three months after Catherine's surgery, her father had a heart attack and died. Six weeks later, Deacon's father died. "The three most influential people in our lives died within 120 days of each other," Deacon says. "It was the most trying time of our lives." Deacon quit her job to focus on Catherine and her younger daughter, Caroline, then age 11, living on money from her retirement and savings accounts. After two years, she began making plans to return to work. "My girls will never recover fully from their loss, but it was time for me to get back to work," says Deacon. But she was looking for more than just a job. "If I was going to spend the next 20 years of my life someplace, I wanted it to be where the people had values that matched mine," she says. "I wanted to work somewhere I believed in and would be proud to be a part of." That place was Mayo Clinic. "I'd worked at Mayo before moving to Georgia, and when I started thinking about returning to work, it was the only place I could think of that I felt truly passionate about as well as valued by," says Deacon. She reached out to former colleagues, applied for a position, and was hired as a medical secretary in October 2011. "We didn't have anything left in Georgia but memories," she says. "When we decided to move to Jacksonville, everything fell into place perfectly. It solidified that I was doing the right thing. It felt like we were starting over." Deacon would soon view the move as much more than just a fresh start. In February, Catherine underwent an examination with Mayo's Matthew Robertson, M.D., division of Gynecologic Oncology. During the exam, Dr. Robertson found what he hoped might be a simple cyst on Catherine's remaining ovary. He ordered an ultrasound, which revealed the cyst was in fact another dermoid tumor. "We were just heartbroken," says Deacon. That heartbreak was soon eased by hope. Dr. Robertson immediately began developing a plan for Catherine's care which would allow for treatment of the tumor while hopefully preserving her fertility. Because Jacksonville does not offer reproductive endocrinology services, Dr. Robertson reached out to Charles Coddington, M.D., chair of the Division of Reproductive Endocrinology in Rochester. Together, they reviewed Catherine's case and determined that she should come to Rochester for treatment. The reassurance she received from the staff at that difficult time meant everything, Deacon says. "Everyone kept saying, 'We're going to take care of this.'" Dr. Coddington didn't think he would be able to save Catherine's ovary, so his nurse sent information regarding tissue and egg preservation options. With a medical plan falling into place, Deacon began making travel plans. The practical aspects of the journey quickly overwhelmed her. "I had just left the float pool and started my permanent position in Gastroenterology. I only had 16 hours of PTO. Moving expenses had taken every last dime. We were barely recovering, and I had to buy two plane tickets on short notice and pay for 10 days in a hotel room," she says. "I didn't know how we were going to cover those expenses." Lois Hemminger, an advanced registered nurse practitioner in Deacon's department, wondered the same thing. "She's a single mom, she's just moved and started a new job," says Hemminger. So she decided to organize a bake sale to raise funds for Deacon. "We held a bake sale for another colleague a year or two ago, and I knew people would come through again," says Hemminger. "We're in a giving profession, and when it's one of our own we want to support each other." On the day of the sale, Deacon's colleagues brought in homemade cookies, cakes, brownies and cheesecakes. Staff were encouraged to make donations of any amount in exchange for a sweet treat. At the end of the day, Hemminger handed Deacon an envelope thick with proceeds. "There was enough money to cover our flights and hotel," says Deacon, still awed by her colleagues' generosity. "That money saved us. I'd only known these people for a few weeks and they rallied around me like we were family. The kindness these people showed to me will stay with me for the rest of my life." A few weeks later, Deacon and Catherine traveled to Rochester. During a three-hour consultation, Dr. Coddington explained that he would try to remove the tumor while preserving a portion of Catherine's ovary. He would also remove any viable eggs and ovarian tissue, which could be frozen and preserved for future use if necessary. Though they believed Catherine was in the best hands possible, both mother and daughter worried about life after Catherine's operation. "Catherine looked at me before surgery and said, 'If I can't have with a daughter what you and I have, I don't know what I'll do,'" says Deacon, her voice still breaking at the memory. In the operating room, Dr. Coddington and his team did what they could to comfort a frightened young woman facing an uncertain future. "Everyone in the OR laid their hands on me and patted me as I was falling asleep," says Catherine. "They made me feel like they all loved me." They also answered her most heartfelt prayer. "Dr. Coddington was able to save half of Catherine's ovary, and also harvested 16 vials of tissue and one egg for future reproductive needs, if necessary," says Deacon. "He and his team saved my daughter's chances of having a baby. And they did it with an overwhelming concern and empathy for Catherine. That is the true meaning of health care. It's the Mayo brothers' philosophy. The experience solidified my return to Mayo as God's plan for my life." The experience also solidified Catherine's plans for the future. Though she'd had an interest in a health care career before, her experience at Mayo Clinic has refined her direction. "I want to become a nurse and work in reproductive endocrinology," says Catherine. It's a position her mother believes she'll be well suited for. "Catherine is going to be able to parlay her experiences to help others," says Deacon. "All of the terrible things that have happened to her have prepared her to do the things she will in the future." It's a future that she hopes someday includes Mayo Clinic. "I know how much my mom loves working at Mayo, and I was amazed by how kind and sweet the doctors were and how much time they took with me," says Catherine. "I would love to be a part of that someday."